1. I repotted the 2 small pots of Great Quaking Ornamental Grass into larger pots. 2. I repotted the Zygocactus cutting which have sprouted new leaves/stems into a larger pot. I’m still disappointed by the sad looking Tomato, Eggplant, etc. seedlings, so I thought I would try an experiment. 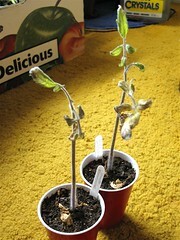 I wondered how the tomatoes would do if I took cuttings of them. I cut them down, dipped the bottom ends into rooting hormone and planted them into a half potting soil/half perlite mixture. About 2 inches of the stems were placed in the soil. 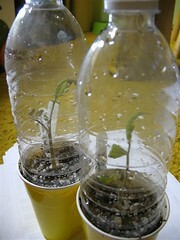 I then watered and covered them with a cut up plastic water bottle to act as a mini greenhouse. This entry was posted in Uncategorized and tagged cuttings, great quaking, tomato brandywine, tomato great white, zygocactus. Bookmark the permalink.